An efficient antivirus is a must these days to protect our devices from malicious online agents that can wreak havoc once they enter the system. Sophos is one of the leading antivirus software that has been a true global leader in the detection and prevention of viruses, Trojans, worms, spyware, and other malware. In fact, this antivirus software has won several accolades for its products and activities in this area. It even has certifications from West Coast Labs, ISCA Labs, and VB100 that vouches for its credibility. Sophos offers varied suites of antivirus and security products that cater to home and business users. Sophos became quite popular with its users owing to its high threat detection and low-performance impact features. Moreover, it extends its protection to PCs, Macs, smartphones, and tablets. Sophos is quite straightforward and easy to use and is known to be quite competent in making improvements to the current version. Installing the Sophos Antivirus is not complicated. In fact, all the antivirus packages of Sophos are light and easy to install. All you have to do is download the software from the official website after purchasing the same. The antivirus scans your system before the installation process begins. Moreover, each USB device that is inserted into the system is also checked promptly. The interface of the Sophos Antivirus is newly enhanced and has been revamped to give it a more intuitive outlook. The functions that the software performs are divided into sections which makes it easier for the user to find a particular function. However, even the default settings on the antivirus are enough for the system to function appropriately without the need for constant monitoring on your part. You can leave the program running and get on with your work without bothering about it. The antivirus’ interface allows you to download real-time reports depicting the activity of the system and notifies you in case of anything suspicious. The Sophos Antivirus offers three variations of the antivirus software—Anti-Virus, Premium Internet Security, and Unlimited Internet Security, each endowed with features to protect your device from an onslaught of viruses and other malware. The Anti-Virus Suite offered by Sophos protects a minimum of 3 PCs and includes free US-based support and free expert installation and upgrades. Moreover, it protects devices without impacting the performance, prevents latest viruses, spyware, and ransomware threats from disrupting the functioning of your device. It even consolidates system alerts and reports any changes in the system. This Anti-Virus suite protects multiple PCs, Macs, smartphones, and tablets. You can avail of this plan for approximately $49.99 per year. The Premium Internet Security Suite is an upgraded plan which offers everything that the Anti-Virus Suite offers. In addition to those features, the Premium Internet Security Suite also offers a 10GB secure cloud storage to protect your files from any sudden threat. It includes anti-phishing features and blocks suspicious emails and website. It allows you to perform all your online banking transactions without any inhibitions. This antivirus software even safeguards your identity by encrypting private information. This product can be bought for around $79.99 per year and protects 5 devices. The Unlimited Internet Security Suite is the supreme antivirus software offered by Total Defense. It includes all the features of the Anti-Virus and Premium Internet Security Suites. This is one of the most sought-after products since it has more to offer; it includes features such as smart PC optimization which can remarkably speed-up the PC start times. It even performs automatic scans and fixes and updates the PC for impeccable performance and also applies automatic patches to vulnerable software and applications. As the name suggests, it protects unlimited devices and costs around $99.99 per year. If you ever experience difficulties in using the Sophos Antivirus, you can always contact the customer support by calling the toll-free number or sending an email. Sophos Antivirus prides itself on safeguarding your devices and ensures that you can perform all your activities undeterred since you are being protected by an award-winning, multi-layered virus protection technology. Sophos Antivirus is equipped with dual malware scanning engines and cloud-based technology which doesn’t wait for the threat to strike. Instead, it proactively protects your device by detecting the latest viruses, spyware, ransomware, and other online threats. It offers total protection for your device without impacting its performance. It is equipped with innovative technology that automatically detects and removes the threat without affecting the performance and speed. In fact, this antivirus software can even scan, download, and quarantine infected files before they can damage the hard drive. The real-time reports displaying the results of all the activities, alerts, and system performance are a great way of keeping the user in the loop. People who are looking for an easy-to-use antivirus that is equipped with all the major features necessary for protecting their devices can opt for Total Defense. 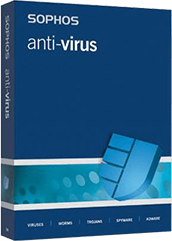 Sophos is one of the most popular antivirus software in the market. Its team is so confident about their Sophos Security Product that no virus can slip through it; if it does, their expert technology advisors will remove the virus from your system absolutely free of cost! The #1 Antivirus For 2019!